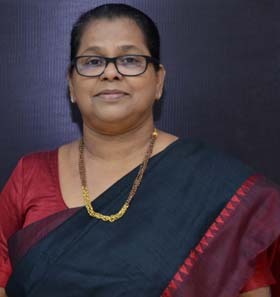 Prof. Dr. Filomina Parayil George, a distinguished fellow of the Chartered Institute of Management Accountants, UK, and a distinguished Fellow Member of Zambian Institute of Certified Accountant, Zambia, is now the Director, SCMS COCHIN SCHOOL OF BUSINESS, India. She had acquitted herself creditably as the Chief of Finance Division of Zambian Railways prior to joining SCMS-COCHIN in 1996 and had, subsequently, served as Professor and Dean of Academic Administration in SCMS CSB. She was awarded PhD for her outstanding research in Financial Economics by Mahatma Gandhi. University. Her academic initiatives conjoined with her research potentials and organizational deftness culminated in the inception of Finance Forum of SCMS, which worked wonders as a powerful platform for intellectual interaction between industry and management students. FCMA (1989) – Passed the qualifying examination of the Chartered Institute of Management Accountants, U.K. Associate Member from 1990 to 1994 and Fellow Member of the Charted Institute of Management Accountants (UK) since 1995. AIDPM (1988) - Institute Of Data Processing Management. U.K - Passed the qualifying examination in 1988 and became associate member in 1990. Academic Administration, Programme review and structuring, Curriculum Design, Curriculum implementation with outcome based learning and objectives, Development of Rubrics for assessment of students’ performance in various courses. Courses handled: Management Accounting, Accounting for decision Making and Control, Financial Reporting and Analysis, Financial Management, Infrastructure Projects and Financing, Security Analysis and Portfolio Management, Strategic Cost Management , Strategic Financial Management. Strategic Cost Management, Working Capital Management. Spearheaded many co-curricular activities. Initiated a finance forum, the platform for intellectual interaction between industry and management students. Introduced an in house journal “The Exchequer” for management students with special interest in finance. Courses in Accounting and Finance, Management Accounting, Corporate Finance and General Management. Changing Customer Eexpectations in Retail Banking” September 2004 . Financial Innovations – A double edged sword – Panorama 2013. Financial innovation- a double edged sword, Paper presented at the National conference “Panorama” at SCMS Kochi 2009. Microfinance – the Kerala perspective, paper presented at the International conference on Microfinance 2009 . Restructuring- lease of new life for TATA Ceramics . Resource Person at Institute of Management in Government for various training programs.